Hello there fellow fantasy fanatics. It has been a little while between articles but now that the drafts have been finalized, and all clubs are now well into their preseason preparations, it’s time for us serious fantasy coaches to start planning for our teams in 2014. Today however we will be looking at a new Giant, Heath Shaw. Shaw has been very relevant in fantasy terms since 2006 and has consistently finished among the top averaging defenders in that time. That’s not to say that he has been a dead-set lock in most teams in that same period, in fact he’s been far from it. Shaw has burned many of us in the past with his inconsistent scoring and his incredible ability to find a way to get suspended or dropped. This has contributed to him not playing a full season since 2007. Most still haven’t forgiven him for his 2011 suspension for betting which resulted in him missing the last eight rounds of the home and away season. What made it worse was that he was one of the most traded-in players in week he got suspended, and with no reverse trade button available at the time he burned so many coaches. Scars are still visible for so many of us today. It really can be best summarized by looking at the above table. His ‘average points’ column is outstanding when we consider he is a defender. Remember not too many defenders will average you close to 100 Supercoach points a game over a season. However a quick run-down of the ‘games played’ column can quickly remind us why we might be hesitant in selecting him. Since 2007 he has missed on average 4.33 games a season, with his best result in that time frame of 3 games missed in both 2010 and last season in 2013. I’m sure consistent isn’t often a word used to describe Shaw but when it comes to missing games; Shaw is as consistent as they come. From a fantasy scoring perspective however, inconsistent is the word that best describes Shaw. “Frustrating” is another that springs to mind. Take a look at his performances from the last couple of years. In both of the last two seasons Heath has managed to score greater than 120 on 5 occasions, but in both those seasons he managed to score below 80 on 4 occasions. Consistently inconsistent. It then begs the question is it really worth picking up Shaw from the start of the year if we can bank on him having at least four games below 80 during the season. I say this because you are 100% guaranteed to pick him up a lot cheaper than the 500k+ price tag he will have from round 1, as a few of those sub 80 scores run through his rolling average. I say this before I even look at what might lie ahead for him at his new club. 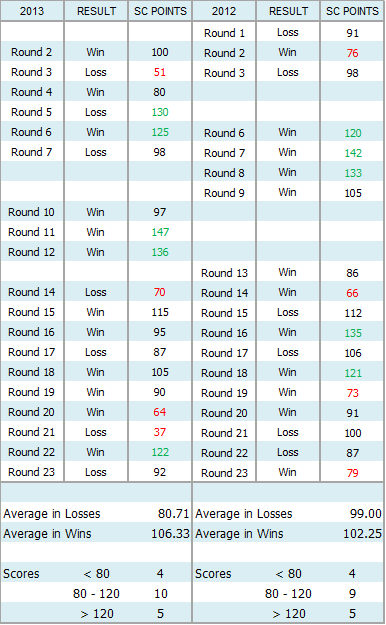 If we look above again we can see that Shaw struggled in a losing Collingwood side last season, only averaging 80.71 in the 7 losses he played in, compared to the 106.33 average in a winning team. If you have kept a close eye on Shaw over the last few years you would notice that he is a last quarter specialist when it comes to fantasy scoring. Another way of putting it is that he is a junk time specialist, picking up a lot of stats as Collingwood chip it around as they close out games when they are in very comfortable winning position. Reverse the scenario where Collingwood are losing and Shaw has copped a heavy tag for most of the game and you will get the scores like the one he had in round 21 against Hawthorn where he managed to score only 37 Supercoach points. The next couple of questions you have got to ask yourself are, how many games do you see GWS chipping the ball around closing out games, and how many games is Shaw going to be the man receiving attention from an oppositions forward taggers? My educated guess would be, not many and a lot respectively. I might have to get Higgo to look over the above equation but I’m pretty confident it all adds up. Before I get too carried away and conclude that Shaw is completely fantasy irrelevant in 2014, it is still wise to analyse all aspects of Heath Shaw in his new side. Comparing GWS and Collingwood from 2013 will help us understand which fantasy relative stats will rise and fall for Shaw, and allow us to see a better overall picture. As to be expected Collingwood dominate the stats and have an advantage in almost all areas. The biggest surprise in that bunch for me is GWS beating Collingwood in the clearance numbers but as far as Shaw goes this stat isn’t all that important. GWS also beat Collingwood in Rebound 50’s but this can be explained quite easily as GWS had to deal with a lot of inside 50’s against them, more than any other team in the competition. The more inside 50’s against, the more opportunities you will have to Rebound the ball back out. This is one area that Shaw is likely to enjoy a bump in his stats but apart from that the rest of the stats don’t make for pretty reading. Shaw is very much an outside player and a lot of his possessions are obtained by picking up uncontested ball in Collingwood’s defensive 50. In fact over 66% of Shaw’s possessions have been uncontested over the last three seasons. As Collingwood play a high possession game, ranked number one in the competition for disposals in 2013 in comparison to GWS who ranked 17th, it would be fair to assume that Shaw’s disposal numbers would take a hit playing at his new club, especially as he relies on uncontested possessions to make up such a large portion of his stats. Fewer disposals will hurt Shaw from an AFL fantasy perspective as he scores so much of his points from his effective kicking as opposed to the other large fantasy contributing stats. He only averaged 3 tackles a game in 2013, 0.5 contested marks in 2013 and failed to kick a single goal. I don’t doubt that his elite kicking will remain in the high 75%+ range but if his disposal averages drop from around the 20 a game mark that he currently has to the 15-18 range that is likely, I can’t see him improving enough in the other categories to offset the drop off in AFL fantasy output. You take this fact into consideration, along with the likelihood of Heath Shaw missing games and producing inconsistent scores that will see his price drop dramatically during the season, I have no hesitation in saying that Shaw will not be featuring in “Mad Mick’s Mayhem’s” starting line-up in 2014. That’s not saying that he won’t feature during the year as he is likely to be cheaper than 400k at some point or another. The only thing that could possibly change my mind is if he is given a new roll at GWS that sees him play through the middle. I will keep an eye on him in this pre-season but I think this is unlikely. Too many reasons not to pick him from the start and I will be looking elsewhere for my defenders in 2014. Were you thinking of locking him away? Have you now changed your mind? Don’t be afraid to get involved and leave a comment below – all opinions are welcome here at Jock Reynolds Fantasy Footy Community! Once swallowed a whole packet of salada biscuits without water in 21 seconds. Top shelf as always Micky. Your point on being able to pick him up at many points during the season due to his predictable price drops is huge I reckon. Paired with the fact that he'll cop a heap of attention from the opposition as the big fish in a small pond it's looking dire re: Shaw. Agreed mate. Danger Will Robinson! Another thing to consider with Heater is his predilection to self destruct when things don't go his way which can really hurt his performances and thus his fantasy scores. GWS are going to lose a bunch of games again in 2014 so expect him to get frustrated plenty and maybe even have some meltdown rounds. So an initial pass from me too especially at that hefty starting price. might be worth running a book….I give it till round 7 before he gets rubbed out. OPTION 2: The round he plays the pies – frustration boils over after being rag dolled by Cloke all game. Can you imagine him throwing the ball into clocked head Monfries style. GWS having ball camped in their defence could be tempting but knowing he’s the big fish little pond man n his uber $ puts pay to any immediate thoughts. Wouldn’t think there’d be any toll change as GWS desperately need someone to rebound the ball the hell out. He’ll gain more SC relevant as GWS become the juggernaut we all await them to become. Great write-up as always, but I think there's one point that needs further investigation. Yes, he'll be playing in a weaker team with an overall lower SC team score (i.e. : less points to share around his teammates), BUT, as you say, he will now go from a team of several superstars to one where he pretty much IS the superstar. As such, you can expect that he will attract a significantly higher % of the team's total SC scores. So even if the GWS team as a whole averages less points per week (maybe, say 1,400 pg), he will definitely get a bigger piece of the SC pie within the team than when he was at Collingwood. Just a thought, possibly worth looking into. Not that's a fair comparison, but look at Ablett. Still managed to improve his average moving from Geelong to Gold Coast, even though he was playing for a weaker team with a lower SC average, AND copping huge tags. The simple reason … there was no one else in Gold Coast to significantly steal his share of the total points from Gold Coast's total. So even though Gold Coast only averaged, say, 1,500 pg (much less than Geelong at, say, 1,800), he still increased his average into the high 120's / low 130's. Thanks for getting involved and leaving a comment. I definitely see where your coming from and you make a very interesting point. It is very true that Ablett got a massive chunk of the pie over the first three years at GCS. He commanded such respect and admiration from the young players that they appeared to give him the ball even when he might not have been the best option to receive it. But like you said youreslf its not really a fair comparison. I don't see Shaw commanding the same awe as Ablett did for those younger GCS players. He is not a Brownlow player, nor will he ever be. I don't see GWS falling into the "give it to Shaw at all costs" mode that maybe the GCS boys fell into with Ablett. Ablett would also fall into the "untagable bracket" were as Shaw is very much easier to shut down. If he has a hard tag he won't pick up very many uncontested possessions and as I said in my article, he relies very heavily on the uncontested numbers for his fantasy scoring. G'day mick, perhaps an article on daisy Thomas mate? Really interested in his prospects next season if his ankle holds up. Yeah he's in my undecided basket so I'd be interested in your thoughts too Mick. He should be dirt cheap for a quality player but will that body hold together for an entire season after playing such little footy the past few years, and just how exactly will he fit into the Blues structure?? Daisy Thomas is in every side. Mick, after reading your post Shaw will not be in my starting team but on my watchlist. Keep up the great work. difficulties with your RSS. I don’t understand why I am unable to subscribe to it. fight against wrinkles and premature aging. If you have to use a wrinkle cream, it is advisable to look up winkle cream ratings on popular blogs and beauty and skin care websites to know which one is right for you. to this subject, produced me personally consider it from a lot of varied angles. Great blog here! Also your web site lots up fast! What web host are you the use of? Nice response in return of this query with real arguments and telling everything about that. home page and see how they create article headlines to get people to open the links. The las tfew messages remind of the time i received an email from the estate of my dead Uncle Victor from Lithuania, stating that i was in line for a massive inheritence……..
BTW – i just won the British Lottery – looks like my Salary Cap has risen to 30m Pounds!! My new strategy is Gun'sNGun's!! !